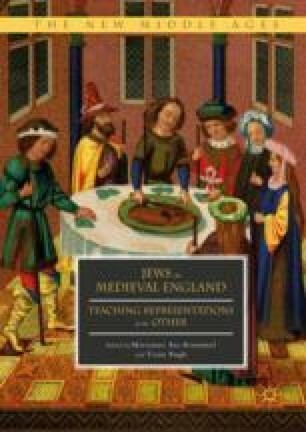 How are Jews marked and perpetuated as the Other in and by medieval English visual imagery? To answer this question, students study and discuss manuscript illuminations, prompted by Peter Miller on object as evidence and Margaret Miles on image as documentation in a challenge to seek medieval meaning. The scholarship of Ruth Mellinkoff, Sara Lipton, and Debra Higgs Strickland provides evidence of visual anti, with students scrutinizing examples created in England before and after the Jewish Expulsion of 1290, including Guillaume le Clerc’s Bestiare divin, the Abingdon Apocalypse, and the Holkham Bible Picture Book. According to their interests and disciplines, students raise issues of interpretation, patronage, and access, assessing how images designate Jews as the Other while reflecting English attitudes and actions toward them.